The wise man, however, will avoid partial views of things. He will not, with the miser, look to gold and silver as the only blessings of life; nor will he, with the cynic, snarl at mankind for preferring them to copper and iron. … That which is convenient is that which is useful, and that which is useful is that which is valuable. 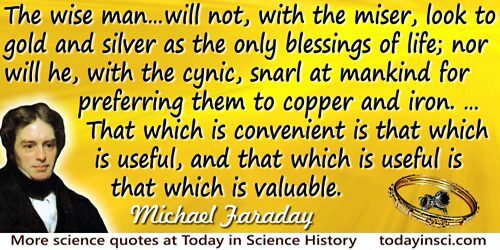 From 13th Lecture in 1818, in Bence Jones, The Life and Letters of Faraday (1870), Vol. 1, 255. When I was a little over eight years old,… I was sent to a day-school…. [By this time] my taste for natural history, and more especially for collecting, was well developed. I tried to make out the names of plants, and collected all sorts of things, shells, seals, franks, coins, and minerals. The passion for collecting which leads a man to be a systematic naturalist, a virtuoso, or a miser, was very strong in me. In Charles Darwin and Francis Darwin (ed. ), 'Autobiography', The Life and Letters of Charles Darwin (1887, 1896), Vol. 1, 26.